Today I went with my mom and grandma to hear a recording of Selected Shorts, "Funny Fiction" hosted by Isaiah Sheffer. If you've never listened before its wonderful, like being a little kid and being completely absorbed by someone reading out loud to you. My favorite reading was David Rakoff reading "Your Mother and I," by Dave Eggers. I can't wait until they play it so that I can say, "Hey thats me laughing!" My mom is kind of obsessed with NPR so by proxy I am as well. In the car growing up it was the only station that was allowed to be on. Afterwards we had awesome meatloaf at my grandparents house where I took my pictures. Speaking of my pictures, have I mentioned how much I hate my point and shoot? My boots are brown and my dress is black, not that you can really tell. Speaking of NPR--if you have Netflix they have This American Life on instant watch and I am obsessed!! So, so good! I had no idea they did an actual tv show for a bit! You still managed to look adorable! I love your hat Kallie and that purse is so sweet! Dude I love npr too! I am determined to get downtown to a Moth story slam this year! 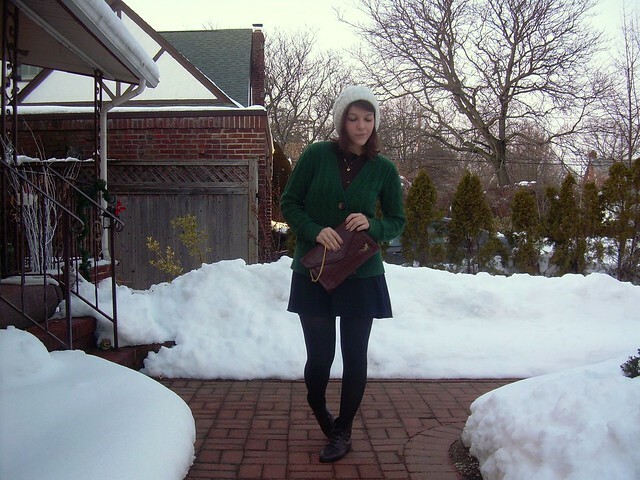 regardless of the shades of black or brown, this outfit is adorable! loving the bold green cardi. I love NPR. I'm so glad I found an App that will play my local NPR station on my iPod Touch. Wait, Wait, Don't Tell Me! and This American Life are my faves. cute cardie - i wish I could wear something like that at the moment - but it's far too hot in Sydney! We always had a few key radio programs that I remember listening to as well. It was always fun in the car! 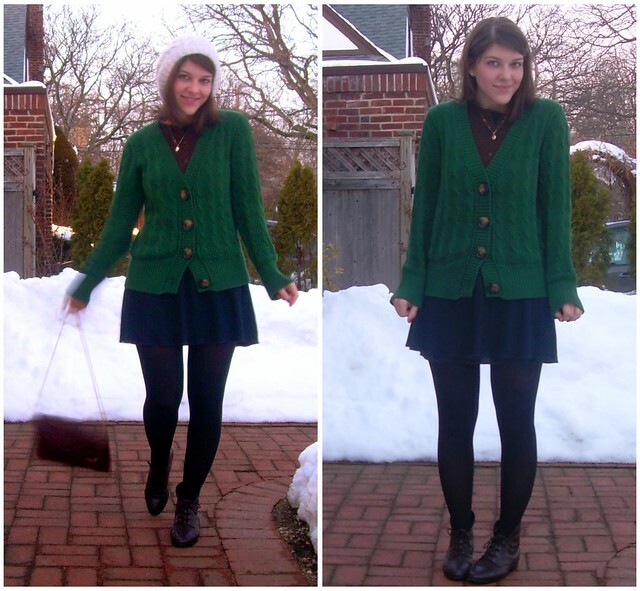 Lovely green cardigan; I particularly like the buttons! Haha, too funny because right now I am wearing that cardigan but in black! I love the green though, wish I had more of that colour! I mentioned you today in my post! And meatloaf, nom nom nom! Aww, the green cardigan is very cute, love the iccle buttons :D the boots are perfect too, just what i'm looking for at the moment, haha! "from mom's college days" That's sooo cool! I wish my mom had more blog-worthy clothing. I love yours! I'm jealous! I love those boots, too. They're so cute! this is a wonderuful ensemble. love the green caridgan and the charm of the dress is boots!